With the holidays arriving quickly, I am getting into DIY all the presents! mode. Making simple but thoughtful gifts by hand is one of my fall/winter traditions. Why? Besides the obvious (I’m a blogging college student: I’m don’t have spending money), I enjoy crafting gifts at home. In the past, my DIY gifts have included homemade soaps, jewelry, or crocheted items. (Wow, that last sentence made me sound more talented than I really am!). This year, I am going to include this homemade ginger salt in my holiday presents. As you can imagine, the possibilities are endless. I found jars similar to these mini fido-style jars to package these for gifts and I know I will end up keeping one for my own pantry. Fresh ginger makes all the difference here. I don't recommend using a store bought powdered ginger. First, dry the ginger. If you have a dehydrator (I used my Excalibur), dry the ginger on a rack at 110 degrees overnight. If you don't have a dehydrator, put your oven on the lowest setting and place the ginger pieces on a cookie sheet. Bake for anywhere from 6-8 hours until completely dry and crisp. You don't have to be too vigilant about the baking time, just make sure the pieces are completely dry. 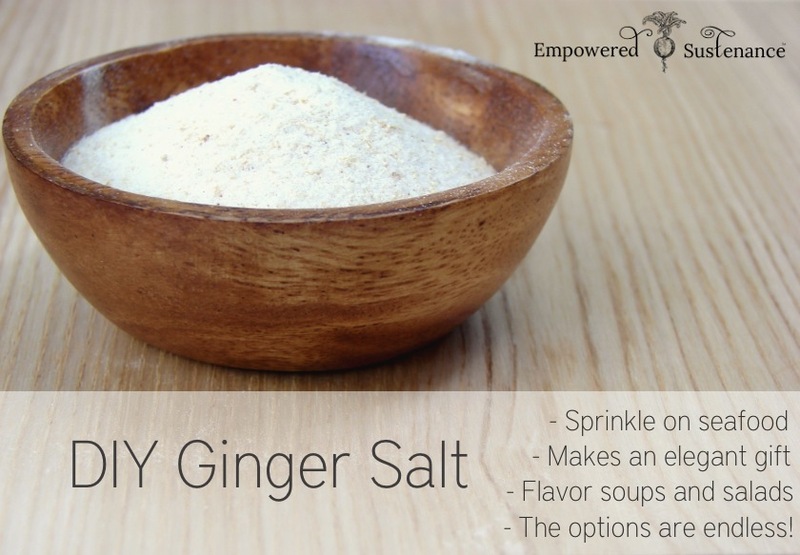 Put the dried ginger pieces in a coffee grinder with 1 tablespoon of the salt and grind until powdery. Stir together with the remaining salt. Store in an airtight container. The salt will have the strongest ginger taste for the first week. Then it will mellow a bit. 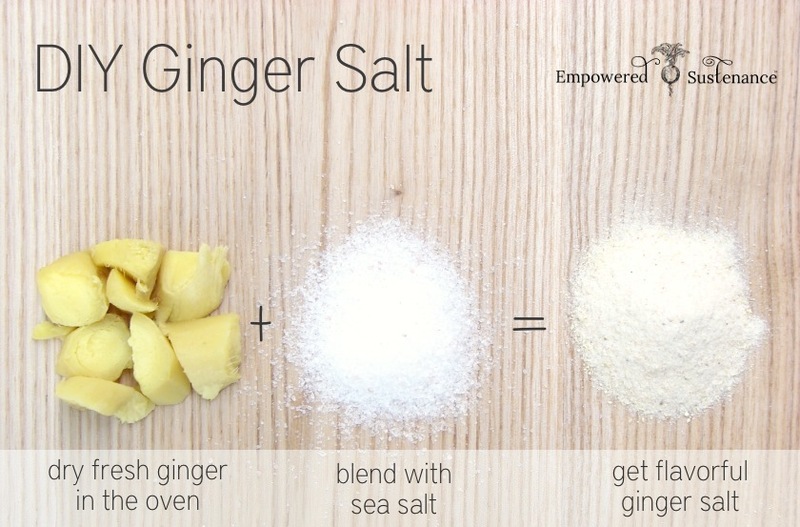 If you want a much spicier and stronger salt, use a 3 inch piece of ginger. This salt blend could, potentially, last indefinitely at room temperature. Both the dried ginger and salt are natural preservatives. But I would suggest using it within 4-6 months (or sooner) for the most potent flavor. Do you make gifts at home? And how would you use this ginger salt? What a great idea! 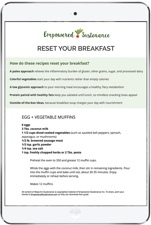 I’m just learning all the benefits of ginger and how to use it in different ways. This would be a great gift idea! I clicked on the link for what you called 3/4 oz. jars, and it came to a jar that is 50 3/4 ozs. I did not see any smaller than 1/2 liter in that group. Did you really find some that are 3/4 oz? The link for Mini Fido Jars just brings up your post on Curry Broccoli Fritters. I’m sorry for the confusion, my brain must have been tired when I was typing this. The jars I used were NOT 3/4 oz, they were 3 oz… I don’t know why I added that extra /4 on the end of it… thank you for catching this! I corrected both links. I didn’t buy the 50 quantity – that was an incorrect link – and I can’t find the link to the ones I originally purchased. I’ve also seen the 3 oz. fido-style jars in World Market, if you have one of those stores around you. I found these small fido-style jars on Amazon, they are 3″ x 2″ and hold 3 oz. Thanks for your response. I got to thinking that a fido jar that only held 3/4 oz. would probably be hard to manufacture. 3 oz. would be a good amount for a seasoned salt. I’m going to make some of this, but I will use the old seasoning salt jars that I purchased. My husband will be very happy that I am using all these jars that I save! Can you also use Real Salt? Would it work the same? Definitely! I love Real Salt, too. I love this idea. Would you mind if I shared this recipe on an edible holiday gift post that I am working on? Would love to include it. 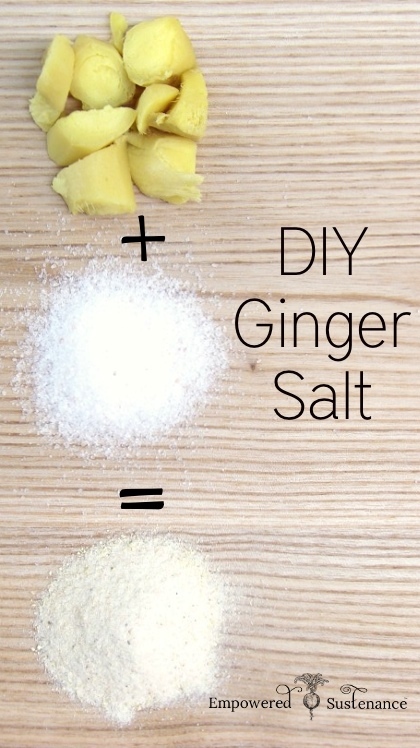 this is such a great idea, I don’t have the dehydrator but will try the oven version as i love ginger gives flavour to everything it touches. This is completely irrelevant to this post, but are you a substitute teacher? I haven’t been asked that before on the blog! Nope, I’m not. Your ginger salt recipe is delicious used on boiled and baked bananas and vegetable salads. I don’t have a coffee grinder. I do have a ninja and a vitamix. Would either of those work? How am I the first one to Pin this? It’s brilliant! I did something similar last year with lovage to make a celery-like salt. It was great! I’m saving all my glass herb jars. It would be fun to give a variety this year!